Margaret Astrid Lindholm Ogden writes as Robin Hobb and as Megan Lindholm. 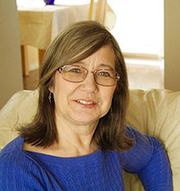 Robin Hobb is one of the most respected fantasy writers of her generation. Hobb began her career writing as Meghan Lindholm. As Lindholm, she has won the Isaac Asimov Science Fiction Reader Award twice and has been a finalist for the Hugo award, the Nebula Award, and the Endeavor award. She began using Hobb as a pen name in 1995 with the publication of the first book in the Farseer Trilogy. Blood of Dragons concludes the current story arc of the Rain Wilds Chronicles, as the dragons are hunted for their life-extending and transformative properties and the Elderlings strive to protect them. Robin Hobb is one of the most respected fantasy writers of her generation. Hobb began her career writing as Meghan Lindholm. As Lindholm, she has won the Isaac Asimov Science Fiction Reader Award twice and has been a finalist for the Hugo award, the Nebula Award, and the Endeavor award. She began using Hobb as a pen name in 1995 with the publication of the first book in The Farseer Trilogy. City of Dragons, is the third novel in the Rain Wilds Chronicles, and sees the return of the dragons to Rain Wilds, but as a shadow of their predecessors. Robin Hobb reads from Dragon Haven. Robin Hobb on tour for The Dragon Keeper. Robin Hobb discusses Dragon Keeper. Robin Hobb's book Fool's Assassin was available from LibraryThing Early Reviewers. Robin Hobb's book The Inheritance was available from LibraryThing Early Reviewers. Robin Hobb is currently considered a "single author." If one or more works are by a distinct, homonymous authors, go ahead and split the author. Robin Hobb is composed of 19 names. You can examine and separate out names.